The following terms and conditions shall apply to and are incorporated into the quotation with which or in relation to which this document is submitted, and shall apply unless expressly modified or excluded in writing and signed by the Contractor and the client. 1.1 The definitions and rules of interpretation in this clause shall apply in these terms and conditions. Commencement Date means the date that the Contractor shall commence work as agreed between the Contractor and the Client from time to time, but no later than 30 days from the date of the Quotation, unless otherwise agreed in writing between the Contractor and the Client. Completion Date means the date the Works are intended to be completed as agreed between the parties from time to time. Contractor means the contractor supplying the Quotation to which these terms and conditions apply. Client means the person, firm or company who enters into a contract with the Contractor for the provision of landscaping works. Intellectual Property means the plans, drawing and Specifications submitted by the Contractor (whether before or after the making of the contract). Quotation means the written estimate provided by the Contractor for the completion of the Works. Site means the location where the works are to be performed by the Contractor. Specification means the documents including detailed plans and/or drawings describing the Works provided by the Contractor. Works means the work to be carried out by the Contractor under the contract as set out in the Specification together with any other services which the Contractor agrees to provide to the Client. 1.2 Paragraph headings shall not affect the interpretation of these conditions. 1.3 A person includes a natural person, corporate or unincorporated body (whether or not having a separate legal personality) and that personal legal and personal representatives, successors and permitted assigns. 2.1 These Conditions shall be deemed to be incorporated into any contract between the Client and the Contractor and shall take precedence over any other terms and conditions (unless identified and agreed in writing by the Client/Contractor, and any deletion, substitution or amendment to these terms shall not take place unless agreed in writing by the Contractor and the Client. 2.2 If there is any inconsistency between the drawings and/or plans and any description of the works in the Specification, the latter shall prevail. 2.3 The Contractor shall carry out and complete the landscape works described in the Specification with reasonable care and skill and in a proper and workmanlike manner. Should any inconsistencies be found between the contract documents, these are to be highlighted and a revised price agreed prior to the Commencement Date. If any such inconsistency comes to light after the Commencement Date the Contractor shall be entitled to be paid a reasonable sum for any extra work or cost thereby incurred. 2.4 The Client shall obtain all permissions, give all notices and pay all fees required under any Act of Parliament or any regulation or byelaw of any local authority or statutory undertaker having any jurisdiction with regard to the Works and the Client shall indemnify the Contractor against any claim, proceedings, loss or expense resulting from the Client a breach of this clause in whole or in part. The Client must produce copies of all relevant approvals to the Contractor prior to the Commencement Date. If not produced, work should not commence. 3.1 The Contractor shall provide the Quotation in writing specifying the Works to be carried out and a breakdown of the cost of the Works. 3.2 The Quotation shall remain open for acceptance for 30 days (or such other period as may be agreed in writing) from the date it is provided by the Contractor. If the Quotation is not accepted by the Client in writing within this period, the Quotation will lapse and be deemed to have been withdrawn. 3.3 If the Client accepts the Quotation in writing within the period stipulated in clause 3.2 the price contained in the Quotation shall become the Contract Sum except as expressly provided in these terms. A binding contract will come into existence when the Client accepts the Quotation in writing. 3.4 The Client may issue to the Contractor reasonable instructions to vary and modify the quality and quantity of the Works. All instructions given by the Client must be given in writing. The Contractor is not under an obligation to carry out a verbal instruction until it is confirmed in writing, except in the case of an instruction being issued by the Client in an emergency e.g. health and safety matters. All instructions issued in an emergency shall be confirmed in writing within 3 days and the Contractor shall be entitled to be paid for work properly carried out in accordance with any such instruction. 3.5 If the variation will alter the cost of carrying out the Works, the Contractor will provide a written Quotation and cost breakdown for the cost of carrying out the variation and the effect it will have on the Completion Date. The Client and the Contractor will agree an adjustment to the Contract Sum in. writing. If the Client receives the amended Quotation and wishes to proceed, the Client shall confirm his instruction to proceed in writing, accepting the new Quotation and the extended Completion Date. 3.6 Where any additional or substituted work is of a similar nature to the Works, such works should be valued to the cost breakdown set out in the Quotation. Otherwise such work shall be valued at fair rates and prices agreed prior to execution and any additional payment due to the Contractor or any extension to the Completion Date shall be added to the Contract Sum and Completion Date respectively. 4.1 The Contractor shall be entitled to receive interim payments at the intervals stated in the Quotation. If no payment interval is agreed the first interim payment shall be due within 14 days of the first agreed valuation date. If no valuation dates are stated or agreed the Contractor may invoice monthly and payment shall become due 14 days after receipt by the Client of the Contractors monthly applications. 4.2 Where monthly payment periods apply the first interim payment shall not become due until 28 days after the Commencement Date, thereafter payment shall become due 28 days after receipt by the Client of the Contractors application. 4.3 Fortnightly or weekly payment periods shall apply as above 3.2, but after 14 days or 7 days respectively. 4.4 Without prejudice to the Contractors other rights and remedies, if the Client shall fail to pay as provided in the above clauses, the Contractor shall be entitled to suspend Works 7 days after giving notice to that effect to the Client. 4.5 The Client shall pay to the Contractor any Value Added Tax properly chargeable on the supply to the Client of any goods and services under these terms. The Client may at any time request appropriate evidence of the Contractors current VAT registration status. Should the Contractor fail to provide evidence then the Client may withhold amounts attributable to VAT on any outstanding payment. 4.6 Interest on all payments due from the Client to the Contractor shall accrue and be payable from the date when payment first becomes due on a daily basis until the date of actual payment at a rate equivalent to 4% over the base lending rate for the time being of National Westminster Bank plc and shall accrue at such rate after as well as before any judgment. 5.1 The Client shall give to the Contractor full possession of the Site together with proper and adequate access to allow the Contractor to carry out and complete the Works and the Contractor shall commence the Works on Site on the Commencement Date. 5.2 The Contractor shall take possession of the Site and commence the Works on the Commencement Date and shall proceed with due diligence and use reasonable endeavours to complete the Works by the Completion Date. a) has to spend extra time completing the Works because of variations made to the Specification. b) the Works are delayed by any act or omission of the Client. c) cannot finish the Works on time for reasons beyond his control such as excessively adverse weather conditions, and/or variable Site conditions and/or any delay caused by the Client and/or late delivery of supplies to site. 5.4 The Contractor shall be entitled to claim any reasonable additional costs incurred as a result of the Completion date being extended due to any events that may occur in clause 5.3 and such additional costs shall be added to the Contract Sum. 5.5 All warranties, conditions and other terms implied by statute or common law are, to the fullest extent permitted by law, excluded from the contract. (b) for any damage or liability incurred by the Client as a result of fraud or fraudulent misrepresentation by the Contractor. (c) loss of profits or business. 5.8 The Contractors total liability in contract, tort (including negligence or breach of statutory duty), misrepresentation, restitution or otherwise arising out of or in connection with the performance or contemplated performance of the contract shall be limited to the amount of monies actually received by the Contractor under the contract. 6.1 Following completion of the Works, the Client shall be responsible for the proper maintenance of the site, unless otherwise agreed by the Contractor and the Client. 7.1 Subject to clause 7.2, the contract shall determine automatically upon the Completion of the Works in accordance with the Specification. f) Suspension of the Works, in whole or in part, for a period of 5 days, whether or not consecutive, due to any act, omission or default of the Client or anyone for whom the Client is responsible. Provided that the Contractor shall have stated the default alleged in a written notice and the Client shall have failed to rectify the default within 7 days of the date of such notice and provided further that the notice of determination shall not be given unreasonably or vexatiously. 7.3 The Contractor will be entitled to be paid by the Client for work properly carried out and/or materials supplied and materials ordered up to the date of determination of the Contractors employment under these Conditions. Client to the Contractor prior to the date of the Quotation. 9.1 Where any materials have been incorporated into the Works or the Site, the property in such materials and goods shall pass to the Client immediately upon their incorporation notwithstanding that the value of such materials and goods may not have been included in any interim payment or final payment or any payment received by the Contractor in respect thereof. 9.2 Unfixed materials and goods delivered, placed on or adjacent to the Site and intended for use in connection with the Works shall remain the property of the Contractor until the value of such materials and goods have been included in any interim or final payment and the amount has been discharged whereupon such materials and goods shall become the property of the Client. 9.3 The Client and the Contractor may agree payment for off site materials and goods in which case such materials and goods shall become the property of the Client upon payment and shall be so identified. 9.4 The Intellectual Property submitted by the Contractor shall remain the property of the Contractor. It may not be used by the Client, nor reproduced or communicated to a third party without the Contractos express prior written consent. 9.5 All plants, trees and turf supplied shall be true in name and healthy when planted. The Contractor shall not be responsible for any loss howsoever arising after planting unless the loss suffered is a direct consequence of the Contractors failure to perform or to complete the Works as provided. Replacement of any plants found to be defective during the first growing season after planting shall be at the absolute discretion of the Contractor. Replacement will only be considered if the Client has maintained the plants properly, and the Client shall have advised the Contractor in writing as soon as the loss or damage became apparent and the Contractor has had the opportunity to inspect the affected plants or areas. 9.6 The grass seed supplied shall have been tested and shall conform to current EC Regulations. The Client acknowledges that a sward cannot be made in one season and several seasons and careful cultivation, weeding and feeding are essential and that no land is free from weeds and that accumulated weed growth and dormant weed seed cannot be eradicated in a limited number of cultivations. When agreeing to cultivate land, the Contractor shall have no liability for subsequent weed growth. 10.1 Any dispute, question or difference arising under or in connection with this contract shall in the first instance be submitted to adjudication in accordance with clause 10.2 and thereafter to the exclusive jurisdiction of the English Courts. 10.2 The Client and the Contractor shall have the right to have the dispute or difference referred to such person or persons as the parties may agree to appoint. The Complaints procedure will be the initial path undertaken. In event that the parties fail to agree upon an independent Adjudicator within 14 days after either party has given to the other written notice to concur in the appointment of an Independent Adjudicator, the Complaints Committee of the British Association of Landscape Industries shall, upon request from either party, offer an Adjudicator. The Adjudicator shall act as expert and shall not be bound to follow the principles of law but may decide the matter submitted to him according to what he considers fair and reasonable in all the circumstances. The costs of the proceedings shall be borne by both parties or as otherwise agreed with the Adjudicator. 11.1 Each of the provisions of these conditions is separate and distinct from the others and if any of them is held by competent authority to be invalid or unenforceable in whole or in part, the validity of the other provisions of these conditions and the remainder of the provision in question shall not be affected. 12.1 The Client shall not assign, delegate or otherwise deal with any of his rights and obligations under the contract without the prior written consent of the Contractor. 12.2 The Contractor is entitled to assign its rights and conditions under the contract in whole or in part at any time. 13.1 This contract is made for the benefit of the parties to it and (where applicable) their successors in title and permitted assigns and is not intended to benefit or be enforceable by anyone else pursuant to the Contracts (Rights of Third Parties) Act 1999 or analogous legislation. 14.1 These terms, and any documents referred to herein, constitute the entire agreement between the parties and supersede any previous arrangement, understanding or agreement between them relating to the subject matter they cover. 15.1 This contract and any dispute or claim arising out of it or in connection with it or its subject mater shall be governed by and construed in accordance with the law of England and Wales. 15.2 The parties irrevocably agree that the courts of England and Wales shall have exclusive jurisdiction to settle any dispute or claim that arises out of or in connection with the contract. 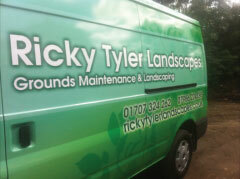 Ricky Tyler Landscapes can provide gardening and grounds maintenance services including Terms and Conditions covering London, Essex, Hertfordshire, Northampton, Buckinginghamshire & Bedfordshire .